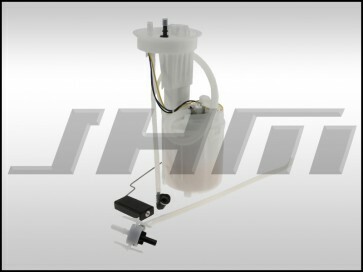 This is a brand new fuel pump made by Siemens/VDO, the Original Equipment Manufacturer (OEM) for this fuel pump for Audi. This fuel pump assembly includes the fuel pump and fuel level sender. This replacement fuel pump has a port for auxiliary heaters for the fuel tank (something offered for cars sold in extremely cold climates). For cars that don't have this option but need a replacement fuel pump, Audi has recommend that customers install a quick-coupler clamp to block off the port on the fuel pump. This piece can be found in our store in the same section as this fuel pump. If you're replacing your fuel pump with this latest version, make sure you add the required quick coupler cap to your cart! This fuel pump is for 2002 to 2003 Audi A4s with either the 1.8T motor or 3.0L V6 with Front Wheel Drive ONLY. The OEM part number for this assembly is 8E0919051CJ or 8E0 919 051 CJ.